Experience the adventure of hunting and being hunt! Dino Crisis 2 is an action horror game released in 2000 by Capcom, a reputed company due to its cutting-edge technology and innovation distributed with every production. In the original game, Regina, the special agent that went on an abandoned island to save Dr. Kirk, was fighting for survival with various races of prehistorical dinosaurs: Velociraptors, Tyrannosaurus, Therizinosaurus and so forth. Now she is back, and also the dinosaurs, that are really mad in this sequel. The researches on the Third Energy continued, and once again, another accident was imminent. A military base, a research institute and a whole city vanished untraceable and in a mysterious way. Armed with the most advanced artillery, Regina and her team embark in this rescue mission. You play as both Dylan and Regina, and you will switch roles as the story unfolds. Beside killing hordes of dinosaurs, you will have to solve puzzles that make sense, collect items and weapons. 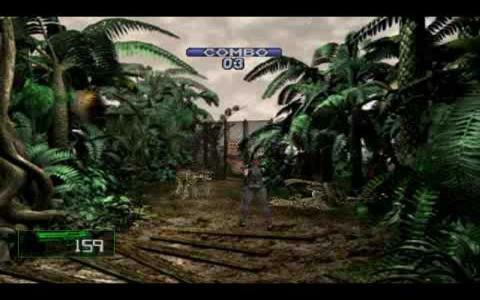 The game is similar to Alone in the dark, from the engine point of view: the Dino Crisis uses 3D models for characters and objects, and static 2D backgrounds for the surroundings and environment. You will learn to use the players special talents and skills in an exciting way. You will earn "Extinction Points" by killing dinosaurs, and depending on your fast capacities and combat reflexes, the points will increase, and "combos" will be activated. Experience the adrenaline and the adventure of hunting and being hunt with Dino Crisis 2!